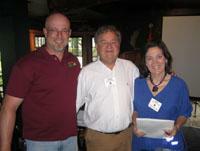 On June 8, 2011, Freeport Rotary inducted two new members. Brad Hyden and Deb King have joined the ranks of Freeport Rotarians serving the communities of Freeport and Pownal. Pictured, L to R, are Brad Hyden, Club President Robin Baron, and Deb King.